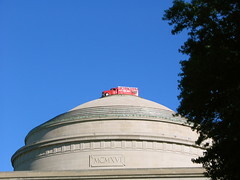 In a manner only possible on MIT’s campus, and probably only relevant to the greater MIT community, someone stuck a firetruck atop the Great Dome. I received a few emails on mailing lists today about a hack, but it wasn’t until I checked my flickr stream that I realized what was going on. To be honest, I didn’t even get it for a few moments. It’s a beautiful piece of work. This entry was posted in MIT and tagged 9/11, hacks. Bookmark the permalink.